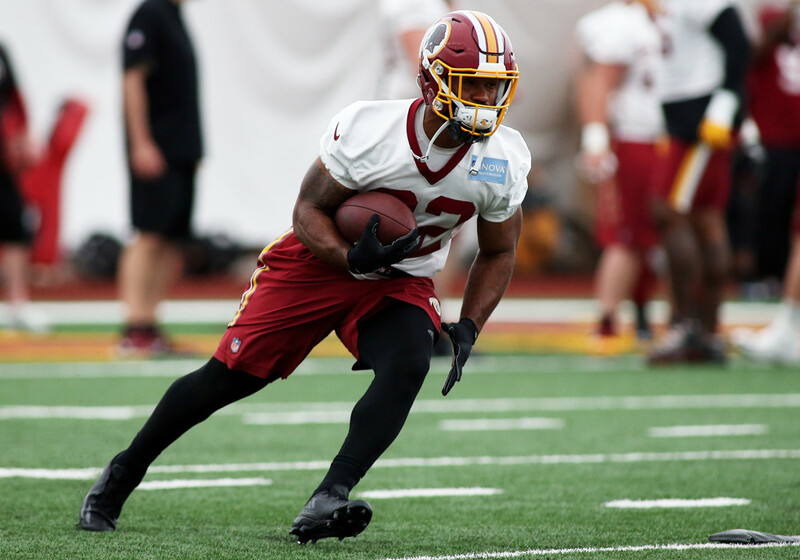 Washington Redskins’ rookie running back Samaje Perine (Oklahoma) will look to break into the starting lineup this year, although it looks like he will have to wait a few weeks before he is featured in any large enough role to be fantasy relevant. Perine was selected 114th overall in the 4th round by the Redskins, and there was a buzz that he could take the starting role from running back Rob Kelley. Perine is a big running back, coming in at 5’11” and 236 lbs. For reference, “Fat Rob” is only 5’10” and 227 lbs. That being said, Perine and Kelley are relatively the same kind of running back, so they will be fighting it out for the job. Chris Thompson should keep his passing downs role, since both Perine and Kelley are not known for their receiving talents. Perine is currently sitting at an average draft position of 9.09 overall in 12-team standard mock drafts. Perine is the 43rd running back off the boards. Over the past month, Perine’s stock has fallen in value by over two rounds, going from a 7.05 to a 9.09 ADP. 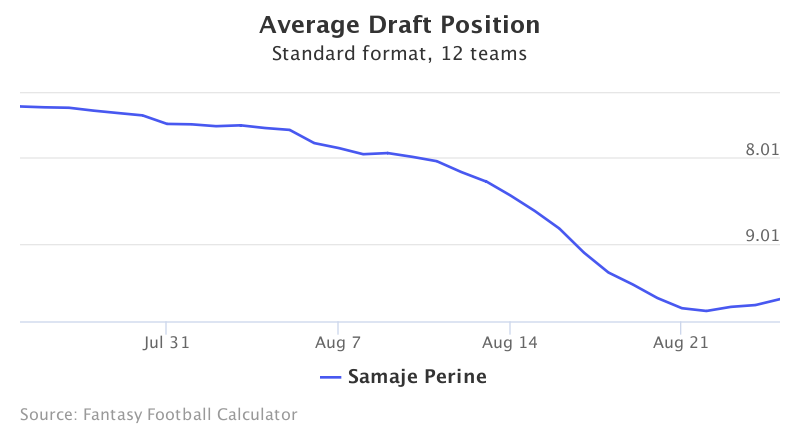 With news coming out that Kelley would still be the starter, followed by a lackluster preseason week 1, Perine’s ADP has dropped quickly. It seems as though the hype train has slowed down. Coming into the season, Perine was slated to take over the starting running back role for the Washington Redskins. Preseason week 1 showed Perine may need a little time to grow into the NFL. Perine rushed 6 times for 15 yards and recorded 0 receptions. He also lost a fumble and struggled in pass protection. Things changed in week 2, as Perine seemed to use this disappointment to fuel his efforts in week 2, rushing 8 times for 45 yards and adding 1 reception for 29 yards. Perine most likely had been nervous for his first NFL game, but settled down and impressed his coaches in week 2, even receiving praise from Rob Kelley. Just when it seemed that Perine would fall into fantasy obscurity, he proved that he may just be worthy of taking a shot at. Samaje Perine is currently being drafted at 9.09 in 12-team standard mock drafts, falling just outside a RB3. Perine has had mixed reviews this preseason, showing a side that wasn’t quite ready for the NFL in week 1, but following it up with a solid performance in week 2. Most likely Rob Kelley will start the year as Washington’s main running back, with Perine being sprinkled in and Chris Thompson taking 3rd down and passing downs. But as the season continues, if Perine plays like he did in preseason week 2, he may start stealing more of Kelley’s touches. If Rob Kelley himself plays poorly, we may just see a changing of the guards in Washington. And if that happens, Perine should easily overachieve vs his ADP at 9.09.